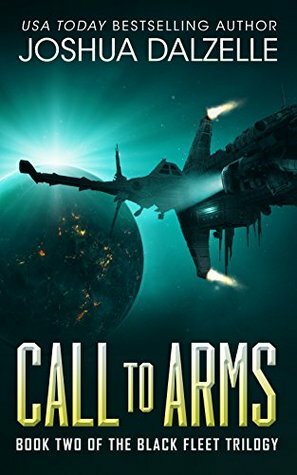 Call to Arms by Joshua Dalzelle is the second book of the Black Fleet Trilogy. In the first book, Warship (see my review), Captain Wolfe and his executive officer Celesta Wright, only just escape with their lives from a first encounter with an enormous alien craft, named an Alpha, that had the power to destroy everything before it, including planetary systems. It’s now four years on, and Wolfe and Wright are back together in charge of the TCS Ares, a Starwolf-class destroyer, which is far more powerful than their previous vessel, the Blue Jacket. In the intervening years, there have been no more sightings of Alpha class craft. Contact with the Phage, as the alien race are now being called, has been minimal, and while their smaller Bravo spacecraft make formidable opponents, they are no match for the new Starwolf-class destroyers. The minimal contact has led the politicians to question why the military is spending so much money on warships when the threat of war seems to have subsided. Relations have deteriorated so much that some of the members of the federation are considering withdrawing their support for the war effort, and their battle cruisers from the alliance, thus severely reducing their total fire-power should the Phage eventually attack. Wolfe is of the opposing view, and wants to make a stand against the Phage, before they have a chance to wipe out humankind. Like the first book, this one also took a while to get going. The majority of the book is spent aboard the TCS Ares, which could have become a bit monotonous, but the pace is kept up by the ship transitioning between various systems performing its mission in several different locations. The political infighting subplot was an interesting distraction, and also kept us guessing about whether or not the TCS Ares would have to make a lone stand against the Phage. I have to admit that while I enjoyed the majority of the book, I was disappointed by the ending. However, it did serve to set up the third book in the series quite nicely, and means that there should be an exciting conclusion to the trilogy.